My time in Lesotho was an incredible one, there are many stories to tell but one of them starts with me going on a home visitation one Tuesday afternoon. I stopped at a hut which was home to an elderly couple, she was 86 and he was 96. I had seen this man before and noticed that his walking stick was broken, so I took him a new one. 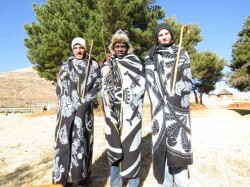 On our arrival we shared the word of God and then gave him the new walking stick. His response was heart breaking. This 96 year old man started to cry. After telling him that it made him look young, he danced out of the hut with tears running down his cheeks, only to come back with a R20 note saying:”this is all I have left, please take it as a token of my appreciation.” In tears as well I had to explain to the man that I can’t take it and that I have already been blessed by them. He cried still as I said goodbye. I have every intention to go back one day and will continue to pray for that old man. 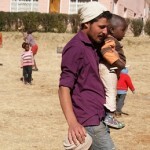 My experience in Lesotho has been amazing. God has really grown me through it and though I went to be a blessing to them they ended up being a blessing to me. Our ministry was amazing and we had countless times where we experienced God’s full glory and majesty. Just one of them was the mountains and scenery around us. God truly is awesome. 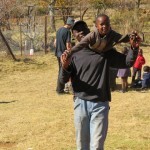 During our time in Lesotho we did door-to-door visits. During one of these visits we met a young couple who just got married. They asked question after question about the Bible, to a point that it became a minor debate. When we asked them if they read the bible and looked for the answers themselves, they said no. With this I was challenged that before I assume anything about the Bible, I must search it first for answers. So many times we ask ourselves about the word of God but yet we never search it. 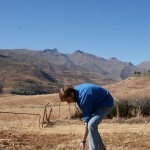 This is one of the many things I learnt in my time in Lesotho.